We stock a variety of Kilim covered stools. 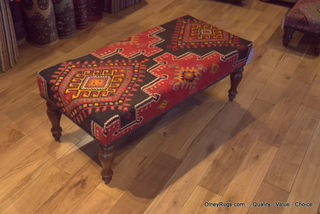 My lovely kilim covered footstools are individually made using genuine hand woven kilims from Turkey, Iran or Afghanistan. I make them with a flat top so you can also use them as a little table. There is the added benefit of never having to find a stepladder to change a lightbulb. They become the perfect step stool for odd jobs. 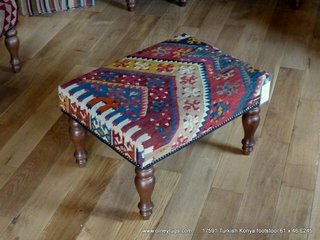 I scale the size of the foot stool according to the design on the kilim so everything looks balanced. Really important is that I build the stools on to a strong 18 mm ply base. This means you can stand on them as a step stool and the legs won't break off. 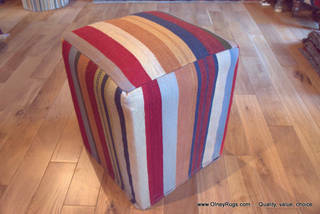 I can make a kilim stool any size you want so call me on 01234712502 to discuss your ideas. Nice Legs? 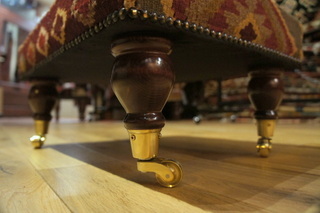 We have a variety of leg styles to suite your room. My new tub stool is more of textile sculpture than a furniture item.